Review: A bigger and better adventure than the first film of what already has the makings of a very successful franchise. A franchise that is quite simply not a plain rip off of Battle Royale as some people would have you believe. The opening begins with the consequences of Katniss and Peeta’s open defiance against the Capitol following their victory in the previous film. Katniss in particular feels the full wrath of the cold President Snow (Donald Sutherland) who threatens Katniss with the deaths of all those she holds dear unless she cools the brewing rebellion that is gaining momentum throughout the nation’s twelve districts. Katniss is seen as the symbol of rebellion and Snow desperately wants to kill her to crush the rebellion. Yet Plutarch Heavensbee (Philip Seymour Hoffman) suggests that she be brought down to the level of the Capitol and the symbol of hope that she has become will be eradicated. Sutherland takes his performance form the first film up a gear and he definitely comes into his own as the cold and cruel leader of Panem. Jennifer Lawrence rose to super stardom following her performance as the film’s star heroine in last year’s film. Following on from this, the 23 year old has got bigger and now has on Oscar for her role in Silver Linings Playbook. The only way is up for her and her performance as the film’s lead character was again fantastic. A strong and powerful female heroine is rare in films these days but with Jennifer Lawrence as Katniss, she gives us the strong female lead that has helped define this franchise and dare I say, helps bring a positive image of women in action movies and not the sulking and needy women that has come from franchises of the past (*cough* Twilight *cough) The returning cast are also on form again with Stanley Tucci as the bubbly Casear Flickman and Elizabeth Banks as the ever colourful and this time much more emotional Effie Trinket. Josh Hutcherson and Woody Harrelson also reprise their roles to great effect. Among the new members of the cast, Sam Claflin is the most noteworthy as Finnick Odair. Yet the likes of Beetee (Jeffrey Wright), Wiress (Amanda Plummer), Mags (Lynn Cohen) and Johanna (Jena Malone) also make strong impressions. Under a new director, Francis Lawrence who is not a relation of Jennifer, the film’s action scenes definitely improve and the frustrating shaky cam has been done away with. This film does focus a lot more on some of the crucial elements that are within the books and as the content of this film is considerably darker than its predecessor. A notable example of this is the significance of the Mockingjay pin that went completely amiss in the first film. The director does a great job in bringing those elements from Collins’ novel to the big screen and all in all it is pulled off really well with some exciting and pulsating scenes especially when we get to the arena which again is done extremely well. Under Lawrence’s direction, this franchise is in good hands and the final two parts of the franchise have got the potential to be even better than the first two. With the third biggest opening in the UK for 2013, it seems the UK public continue to want the odds to be in their favour. 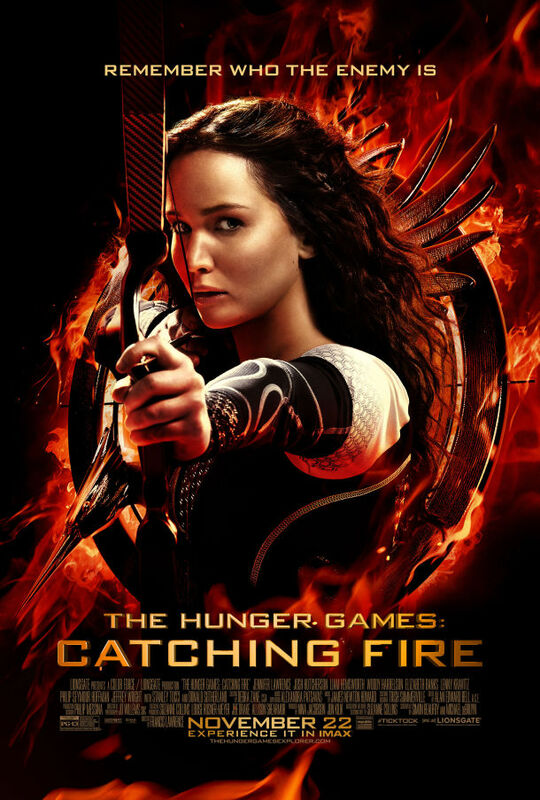 This film definitely delivers what the hordes of passionate Hunger Games fans wanted to see. It was exciting, dark and was all round perfectly executed. It was much more loyal to the book than the first film. While it was not completely loyal, it was still very enjoyable and I eagerly await the next instalment of this franchise. Upping the stakes as a sequel should, Catching Fire delivers much more compelling action with a really solid story that ensures the odds are very much in this franchise’s favour. Excellent review, I’m really excited about seeing this one.